President Donald Trump says he's "not happy" with his top health official, putting Tom Price's job in jeopardy after his costly charter flights triggered a congressional investigation of administration travel. Asked whether he's planning on firing Price, Trump responded Wednesday: "We'll see." A former GOP congressman from Georgia, Price played a supporting role in the fruitless Republican effort to repeal Barack Obama's healthcare law, which has been another source of frustration for the president. Price is known as a conservative policy expert, but his penchant for taking private charter aircraft on the taxpayer's dime is creating new headaches for the White House. Late in the day, Price's office said he's heard the criticism and has taken it to heart. There was no indication he'd be stepping down. Prompted partly by controversy over Price, the House Oversight and Government Reform Committee on Wednesday sent requests for detailed travel records to the White House and 24 departments and agencies, dating back to Trump's first day in office. The letters were signed by the committee's chairman, Rep. Trey Gowdy (R-S.C.) and its ranking Democrat, Elijah Cummings of Maryland. Lawmakers are demanding information on political appointees' use of government planes for personal travel, as well as their use of private charters for official travel. The committee wants details by Oct. 10. The president vented his displeasure with Price to reporters as he left the White House for a trip to sell his tax overhaul in Indianapolis. "I was looking into it, and I will look into it, and I will tell you personally I'm not happy about it," Trump responded when asked about Price's travel. "I am not happy about it. I'm going to look at it. I'm not happy about it and I let him know it." Trump's comments seemed to take the health secretary's office by surprise. For hours there was no response from HHS, but Wednesday evening a spokeswoman released a statement. "As the secretary said over the weekend, he's heard the criticism and the concerns," said spokeswoman Caitlin Oakley. "He takes that very seriously and has taken it to heart." 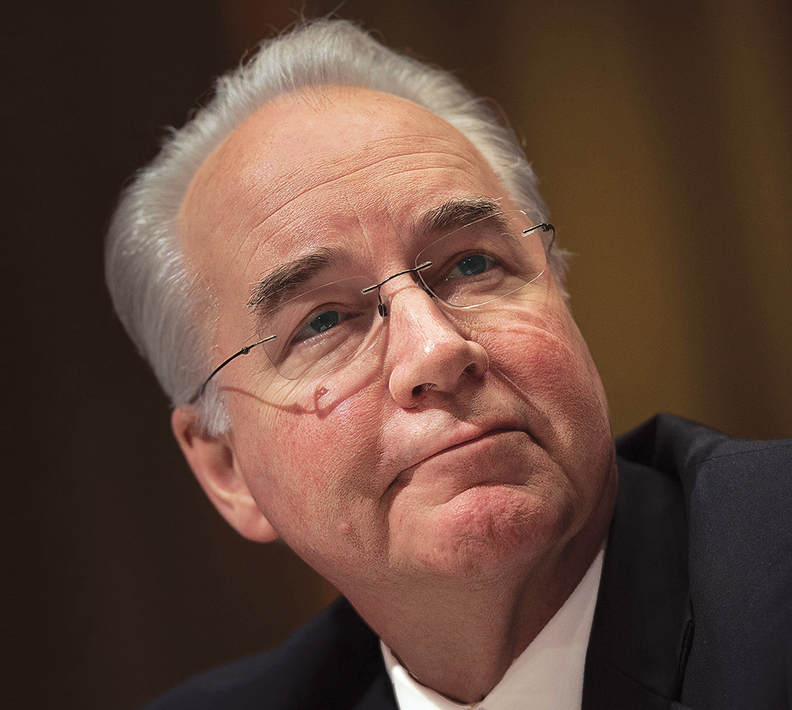 Previously Price's office had said it's cooperating with a review by the HHS inspector general, and he will stop flying on charters until that investigation is complete. Price's travels were first reported last week by Politico, which said it had identified 26 charter flights at a cost of hundreds of thousands of dollars. Cheaper commercial flights were a viable option in many cases. The HHS inspector general's office is looking to see if Price complied with federal travel regulations, which generally require officials to minimize costs. Price's office said the secretary's demanding schedule sometimes does not permit the use of commercial airline flights. Trump's publicly-expressed displeasure — or ambivalence — has been a sign in the past that the tenure of a key aide will soon be over. Back in August, the president was asked if he still had confidence in Steve Bannon, then a senior strategist in the White House. "He's a good person. He actually gets very unfair press in that regard. But we'll see what happens with Mr. Bannon," Trump said. Bannon was out three days later. Price, an ally of House Speaker Paul Ryan, is a past chairman of the House Budget Committee, where he was known as a frequent critic of wasteful spending. As HHS secretary, he has questioned whether the Medicaid health insurance program for low-income people delivers results that are worth the billions of dollars taxpayers spend for the coverage. He's a former orthopedic surgeon who once practiced in an inner city hospital. A group of Democratic lawmakers on Wednesday called for Price's resignation. Reps. Ruben Gallego of Arizona, Ted Lieu of California, Brenda Lawrence of Michigan, Jamie Raskin of Maryland and Pramila Jayapal of Washington said in a letter that Price breached the public's trust. Republicans, however, largely remained mum. GOP lawmakers know Price as a colleague and regard him as a serious student of policy who can instill conservative priorities in the vast bureaucratic apparatus of HHS. Other members of the Cabinet contacted by The Associated Press last week said they personally foot the bill for chartered travel or reimburse taxpayers the difference between commercial and chartered travel. The exceptions are when they are traveling with the president or vice president, who fly aboard government planes.